Thank you for your support during this difficult time. Please enhance this tribute to Gilbert by adding your memories and photos. 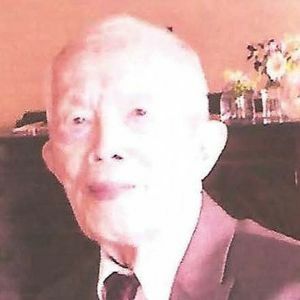 Cambridge - Gilbert Hsiaopin Owyang, a former longtime resident of Shrewsbury, died Sunday, May 6, 2018 in Saint Patrick's Manor in Framingham. He was 97. Gilbert was born July 7, 1920 in Tianjin, China. Professor Owyang retired in 1990, Professor Emeritus from the Electrical Engineering Department at Worcester Polytechnic Institute (WPI). His publications include Foundations of Optical Waveguides (Elsevier 1981) and Foundations of Microwave Circuits (Springer-Verlag 1989). Dr. Owyang received his B.S. from Tatung University (Taipei, Taiwan) in 1944 and his M.S. and Ph.D. from Harvard University in 1950 and 1959, respectively. Often, Dr. Owyang remembered with great fondness his WPI students and his years teaching and research at WPI. Upon retirement, Dr. Owyang accompanied his wife to California where he was able to pursue further several life-long interests. These include wood-working, learning how to play the African Djembe and the ukelele. He is remembered by family, friends and colleagues as a gentleman-scholar. He took great pride and comfort in family, especially in his sons and grandsons. Dr. Owyang is pre-deceased by his parents, Yet C. Owyang and Lily K. Owyang, his sisters Sr. Joseph Ignatius Owyang of the Sisters of Charity, and Beatrice Owyang Tse (wife of Dr. Francis Tse). He is survived by his wife, Lily S. Owyang; his sons, Kevin Owyang and Colin (married to Dr. Deirdre O'Reilly); grandsons Ryan Owyang, David Owyang and Connor Owyang, niece, Dr. Alice Tse, and Dr. David Tse of Cincinnati. A memorial will be scheduled for a later date. In response to inquiries, the family requests donations in memory Professor GIlbert. H. Owyang, be made to The WPI on line at wpi.edu or by sending checks, payable to WPI, to The WPI Fund, 100 Institute Road, Worcester MA 01609. Life Stories provides friends and families a forum to post their favorite stories and memories of Gilbert Owyang ensuring the precious experiences are never forgotten. Share joyful times, post a photo that captures the moments you cherish, and allow others to reply, relive and remember.